PostRank (ex–AideRSS) had been acquired by Google in June 2011 and shut down in May 2012. My previous post on coping with information overload was probably too much theory and no actual tools (even no fancy pictures). So I decided to do small follow-up about online service that may help you deal with giant RSS feeds. 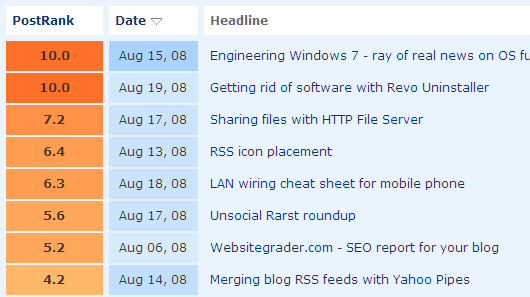 AideRSS takes any RSS feed, does some calculations and assigns so-called PostRank for each post. Sounds simple but there are lots of issues here. AideRSS takes feed and looks on each post. It tries to get information from actual post (number of comments) and social media (digg, delicious, google, etc). Claims to track number of clicks in RSS readers but there is no mention of ones used. 10.0 is one of the bests posts in this feed. if you are publisher (blogger) submit your feed even if you don’t plan to use service. Overall calculations may be not very accurate. There are lots of complains about it missing comments, bookmarks and such. Again – the more data it has the better results are going to be. There is plenty of different things you can actually do with results – sign of good service in my opinion. You can simply take a look on site on latest post or filtered lists (good, great, best, top 20). They seem to promote PostRank system outside their own service as well so there is info on integrating it with NewsGator Online and Google Reader. Use it with giant feeds from sites that produce dozens of posts per day or mashup feeds from multiply sites. Suitable for analyzing your own feed as well. Don’t use it with usual feeds from separate sites or blogs – you are going to miss too much. Discovered via problogger visit for brief video overview of AideRSS. I also read about this on ProBlogger, I love the service. Proves a handy way of analyzing your works and other peoples works. Truly something people should consider using often. Really cool! I gonna give it a shot. As you said in the post, the problem is that it’s missing many thing, StumbleUpon among them. For instance, once I got thousands visitors for a post that only got a score of 7 out of 10 using their service. Yep, what I like in concept – it does something that it’s pain to do manually. Computers are good at doing such boring things like gathering and comparing data. AideRSS clearly far from perfect in current state but I like core idea and if they keep working at it (which they seem to do looking at activity on support page http://getsatisfaction.com/aiderss/ ) it may mature in truly great tool. I’m not saying it’s bad, just that AideRSS could be greatly improved. Thanks for the very comprehensive write-up! The issue with missing comments and such is a pain, but unfortunately since there’s not just one reason why that can happen, we need to address it on an individual feed basis, so we encourage everyone to ping us either on the Get Satisfaction site or email me. We do keep adding new sources of analysis, but unfortunately we are limited by the data availability. We’ve received a number of requests for StumbleUpoon, for example, and would love to add it, but have yet to get access to an API. For those who can tweak their RSS settings, we can display a great many items (more than just the 10 or 50 or 100 that seem to be standard). Re. the rankings, the popularity of a single post isn’t quite the whole story. For example, if one post gets a flood of bookmarks or comments or what have you, yes, it will certainly come up scoring high, but at the same time we analyze it in terms of past site performance, so we take anomalies like the “digg effect” into account so that it doesn’t completely skew all the other posts’ results (automatically making them 1s, for example). And if there’ve been other posts that have done well recently, then compared to them, a highly engaging post will do very well, but won’t be head and shoulders better than the previous ones. Hope that makes sense. As always, we’re always interested in questions and feedback as we continue to work on improving things. We will also be launching the next version of our site soon, which will have a lot of really cool new and improved functionality. Stay tuned! If I may voice my opinion about data issues – service is not clear enough on data sources and how they influence score. but there are only two comments on it and all other values shown are at zero. I understand that something had worked with this post but I have no data on what it was. One “theme” re. how rankings work is that PostRank scores are calculated based on a number of posts, not based on a span of time. Another is that within a group of posts being analyzed, with relatively consistent engagement performance, PostRanks are most inclined to rise, rather than go up and down like a typical graph might. At the moment we’re also working on fixing delicious analysis as well. Some things stopped working when they released their new version.